When we said we would like to see the Cadillac Escalade EXT live on after the 2013 model year, this isn’t what we had in mind. What you’re staring at in disgust is the new Shaanxi S102, and it’s the vehicle that will put the state-owned conglomerate on the map, albeit for all the wrong reasons. Behind the faux-Cadillac face will be either a 91hp or 100hp four-cylinder engine — roughly a quarter of a real Escalade EXT’s output — each choice mated to a five-speed manual transmission. Unfortunately, this isn’t the first Caddy clone in China, and certainly won’t be the last. Look at the grill its an Escalade EXT V so it will have to use the 100 hp engine. You’re right! This is the long awaited EXT-V! I can’t wait for it’s ring times! The X6M won’t know what hit it! 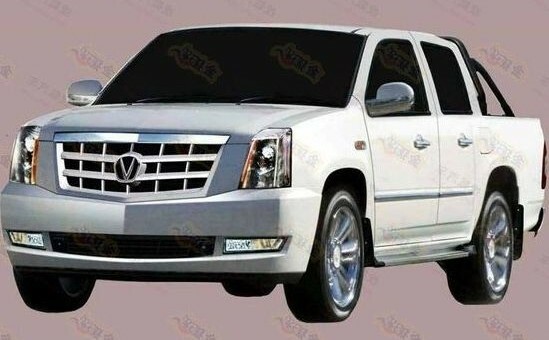 This is China, I doubt suing would do much but maybe GM could get China to force this chinese company to halt sales in 10 years, but by then no one will remember the Caddy in its current form. does gm care if china take over it trade marks???? Command and Conquer reference aside, this really needs to stop, but I doubt it will. If BMW and Daimler couldn’t get them to stop, I doubt GM can, either. The worst part is that, from what little I know about the trademark regs over there, the government basically allows them to get away with it (and may or may not actively encourage them to do this). The only real consolation is that this POS is probably just as unsafe as every other homegrown Chinese car. Well, you know what they say “Imitation is the Highest Form of Flattery”…….But c’mon now……….Really……..This is why we should keep the EXT going, not only is it Truly Unique in itself, but give it the New Body with New Sheet Metal, Killa Gas and Diesel Power-train Options with 8 Speed Transmission, Major Overhaul of the Interior with more Sic Tech inside and out, Cue it up with the CUE and show them Fools how we do it and why you buy American Cadillacs!!! But you haven’t answer the question; Why should GM keep building the EXT? Calling it “Truly Unique in itself” isn’t enough. And Yet Gm continues to do business with that country,You make a deal with the devil you will get burnt!